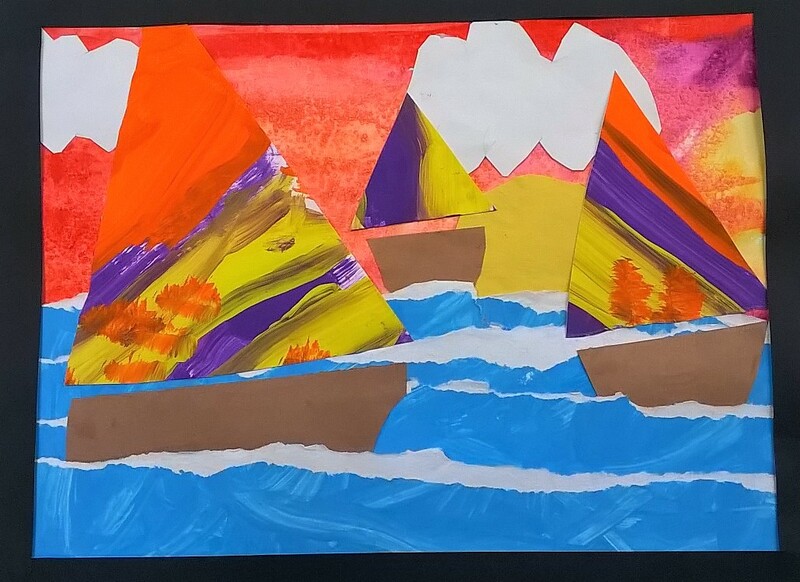 Kindergarten students practice their cutting and gluing skills in a sailboat collage using watercolor and tempera paint. Emphasis on scissor safety, cutting and painting techniques. Students will be able to properly demonstration scissor safety and cutting techniques. Students will learn about collage in the creation of sailboat seascape. Students will understand the difference between watercolor and tempera paint. Students will learn about secondary colors, and warm and cool colors. Demonstrate how to use warm colors to paint a sunset. I use watercolor paper, watercolor or tempera cakes, and salt. Demonstrate brush stroke techniques, students should work quickly and sprinkle salt on the wet paint to create a texture effect for the sunset background. Demonstrate how to use secondary colors to paint a pattern on white tag board that will be used to make our sails from. (students previously learned about primary colors and shapes in our last project) Review brushstroke techniques and go over expectations for clean up. Demonstrate how to paint waves using tempera or acrylic paint on tag board. I explain this doesn't have to be perfect because we will eventually rip this paper into strips for our ocean scene.Review clean up procedures. Demonstrate how to cut 3 boats out of brown construction paper, one large, one medium, and one small boat. I allow students to use circle templates to trace a half circle. Students will finish early, I have them clean up and color their practice sailboat pictures from day one. Demonstrate how to cut triangle sails out of their pattern paper using their 3 boats as a guide to measure so the sails fit properly. I show them how to use a ruler to draw their sails. 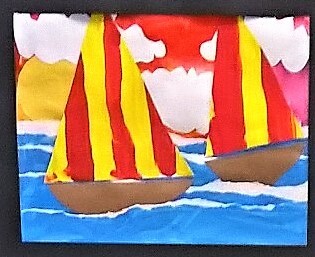 Students will finish early, they may continue to color their practice sailboats, or read to them a book about sailing. Demonstrate how to rip their blue wave painting into strips. Students should now have all their pieces, allow them to play with their arrangement but not to glue anything down until the following week. I allow students to decide if they want to use their sun and clouds or leave the sky plain. (I prestaple their water strips to the bottom of their sunset)Demosntrate how to arrange and glue the pieces in their collage. Make sure large boat is up front, medium boat is in the middle, and small boat to the back. Go over background, foreground, middleground. Did the student make a sailboat collage? Did the student demonstrate proper scissor safety, cutting/gluing and painting techniques?